Last week’s Daily Norm was a glorious panoply of Tuscan views, scenes and sensations and it’s not quite over yet. For hot on the heels of my Tuscan weekend comes my 11th interpretative landscape – part of my Interpretations collection which I began some three months ago after being inspired by the sumptuous landscapes and cubic shapes of Italy’s Amalfi Coast. Back in Italy this September, and one glimpse up through the vine-packed fields of Donoratico to the emerging landscape of Castagneto Carducci made me realise that this pretty hill top town was an obvious contender for an interpretative overhaul. 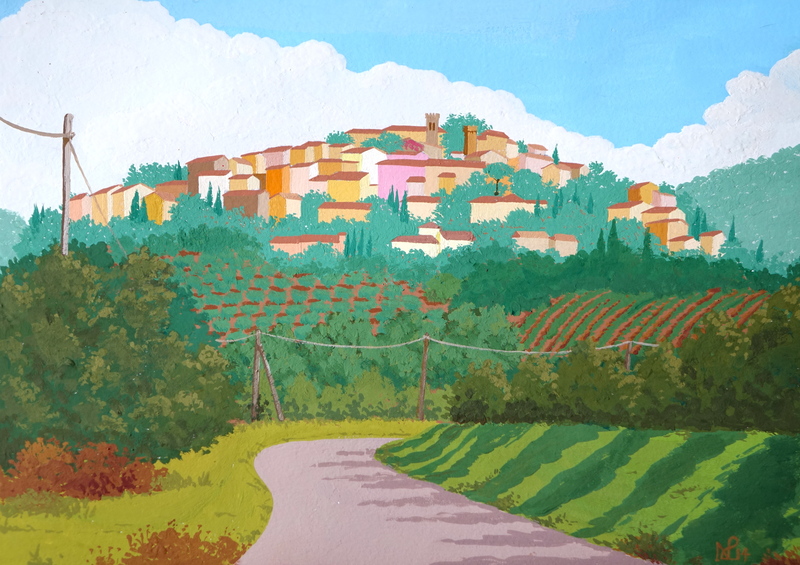 For with its tightly packed cluster of pastel coloured houses all set up on a Tuscan hill, Castagneto offers a wonderful synthesis between petit-urban development set amidst a stunning landscape, which is exactly what the Interpretations series sets out to emulate. And I think this 11th Interpretation is probably one of my favourites of them all. I love these colors! What a wonderful picture. Oh thank you!! I’m so glad you like!